The top view of the keyboards seemed slightly different. Razer Huntsman elite has dedicated multimedia keys plus a new multimedia dial. But it doesn’t end there because this volume wheel encompasses several functions. While alongside the function key row, the Logitech G513 has designated set of keys as dedicated keys for turning on things like game modes and lighting. This means that you don’t have to have a Logitech Gaming Software installed to get some of those functionalities. You might as well enjoy the specific gaming keycaps that Logitech includes in the box to help you find the keys you need without first going into the home row mode. Comfort is one of the things associated with both keyboards. The inclusion of a detachable wrist rest adds to the build quality of the keyboards making it feel solid and tactile. The wrist rest/palm rest as the case may be offers an extremely comfortable gaming and typing experiences. But there abounds a little difference in the two keyboards. For the Huntsman Elite, a magnet connection makes the keyboard and the wrist rest stay connected. Once connected, there occurs a LED strip that runs through the underside of the wrist rest. The light can also be synced with the rest if the keyboard to create a lighting effect. But the wrist rest in the Logitech G513 is relatively light and features a headset guide in the same place underneath the rest. It supports the hand as do the Huntsman Elite. When you flip the keyboards to the back, you’d find standard flip-out stands that raise the keyboard and prevents them from dancing around the top of your desk. The Logitech G513 also included a single USB 2.0 pass-through port at the back for plugging in any USB powered devices. This could be used for a wireless receiver for your gaming mouse, or to charging mobile devices or plugging external drives. A USB pass-through is missing in the Huntsman Elite which really affected the quality expected from a gaming keyboard worth so much dollars. As well as the USB pass-through, the audio pass-through is missing. The main point of attraction in the Huntsman elite is the opto-mechanical switch. The technology behind this design is pretty interesting. If a cap is popped out of the Huntsman elite, you’ll see the mechanism. It is a purple switch that is joined with a metal spring and a plastic cylinder at the back. The opto-mechanical switch creates a great mechanical action for both gaming and typing alike. It makes the Huntsman elite very fast and accurate unlike the typewriters or other mechanical keyboards that rely on the mechanical switch. 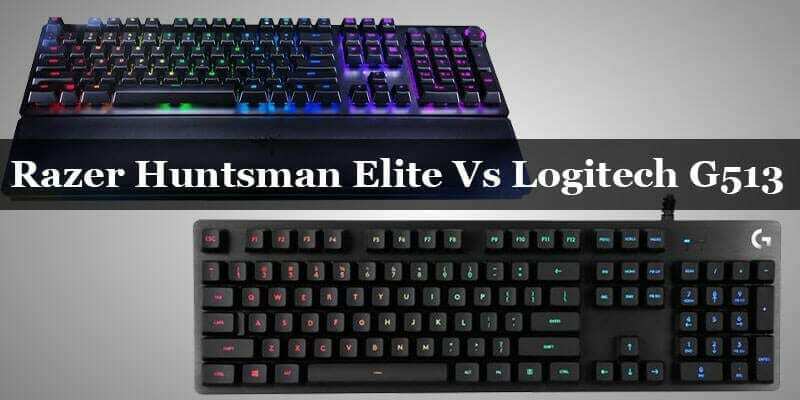 So accurate typing and rapid key response are associated with the Huntsman elite. The Razer Huntsman Elite is one of the first gaming keyboards to combine the use of the novel optical technology and multiple mechanical switches. It is a fantastically quick keyboard that runs on opto-mechanical switches. Razer Hunstamn Elite compared with the speed of light because of its opto-mechanical switches. It has delivered the best typing experiences there is. As well, the Logitech G513 relies solely on the advanced design, with a fast 1ms report rate. As well, it uses two mechanical switches: the Romer-G tactile, or the Romer-G linear. The Romer-G tactile responds with a bump when pressed on and the Romer-G linear uses a smooth travel, with no noticeable actuation point. According to Logitech, it says the new Romer-G linear delivers a quieter and a twenty-five percent(25%) faster keystrokes than the previous keyboards. Logitech confirms that he developed a key switch that is better than the Cherry MX Red switch. It does not only make gaming faster, the Romer-G linear switch is something we actually enjoy typing on. The huntsman elite alongside the K95 RGB platinum holds the highest prices in the market which is Under two hundred dollars. Logitech G513 also are close in pricing with the Huntsman Elite with an Under hundred and fifty dollars price tag. The Razer Huntsman Elite as stated earlier is currently the most expensive gaming keyboard alongside the K95 RGB Platinum. However it has achieved a high point and gives users the best keyboard experience. Typing and gaming have never been so easy and full of joy. The Logitech G513 is more of a step up model to its predecessor, the Logitech G413. They are almost the same except for some differences. It has a higher-end price which gives consumers to pause and check other products, whereas its predecessor was a well-equipped budget-friendly gaming keyboard. Consumers go for keyboards because of the qualities they possess. These two keyboards, however, included qualities that would make consumers dip down their pockets to purchase the peripherals inspire of their high prices.